On April 17, 1975, the Khmer Rouge army marched into Phnom Penh. Over the next few frantic days, journalists covered what they saw before they were forced to leave. They watched, astounded, as Khmer Rouge soldiers, young peasants from the provinces, mostly uneducated teenage boys who had never been in a city before, swept through town. For them, Phnom Penh offered many mysteries. The boys didn’t know what to make of telephones, or toilets. But they set to their job right away, evacuating Phnom Penh, forcing all its residents, at gunpoint, to leave behind everything they owned and march toward the countryside. Hospital patients still in their white gowns stumbled along carrying their IV bottles. Screaming children ran in desperate search for their parents. Srai Sim was born in 1954 in Phnom Penh, Cambodia’s capital city. She grew up as the only daughter in a family of five children. Her father was a government worker and her mother was a home maker. At the age of sixteen Srai Sim got married. Her husband, a sergeant in the army, was a good hard working man. Soon after the marriage this young couple had their first daughter, Srai Dtop. A hopeful future lay before them. It was during this time (1975) that the United States was in its last days of war with Vietnam. Cambodia was a nation in turmoil, partly as a result of that war, but also because of a politically unstable history. In April 1975 the Khmer Rouge (the Cambodian communist party) sent its soldiers into Phnom Penh in order to evacuate the city. The residents of Phnom Penh were told that the evacuation was for their own safety as American planes were going to bomb the city. They were also told that they would be able to return in 3 days. But the truth was that the Khmer Rouge (KR) saw all cities as a capitalist threat to their communism. It was the mission of the KR to turn Cambodia into a total agrarian society completely under KR rule. Emptying the cities was their way of ending any non-agricultural lifestyles. At that time Srai Sim was 7 months pregnant with their second daughter and their oldest was 3 years. 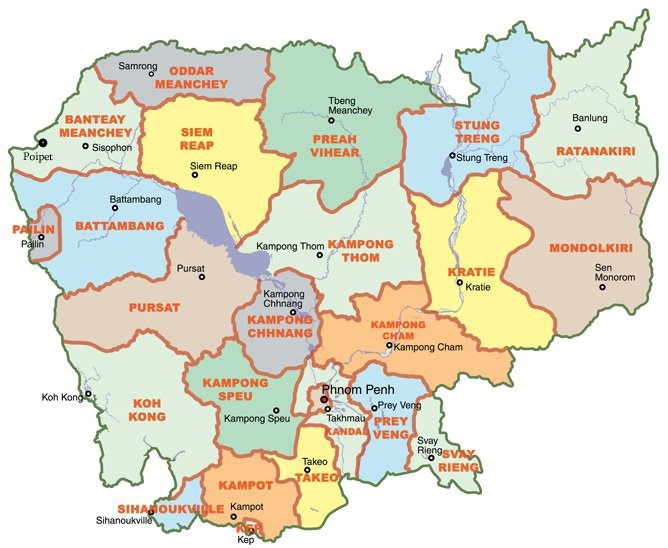 Srai Sim’s family was forced out of Phnom Penh, and along with many others, they were driven like cattle to the province of Kampong Speu (see map below). They were made to walk the entire distance. 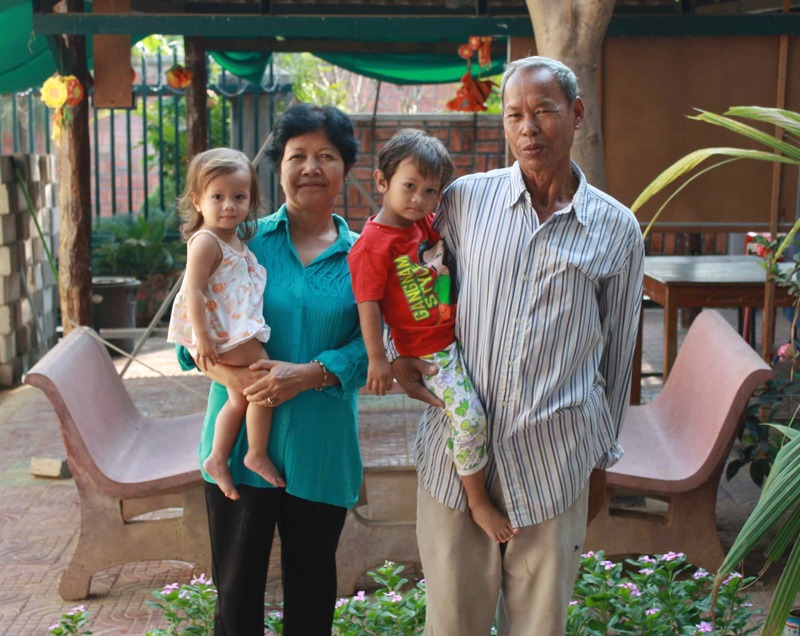 In Kampong Speu their second child, Srai Owne, was born and one month after the birth they were relocated to the village of Moung Roussei in the Battambang province. Here the family was given one week to rest. 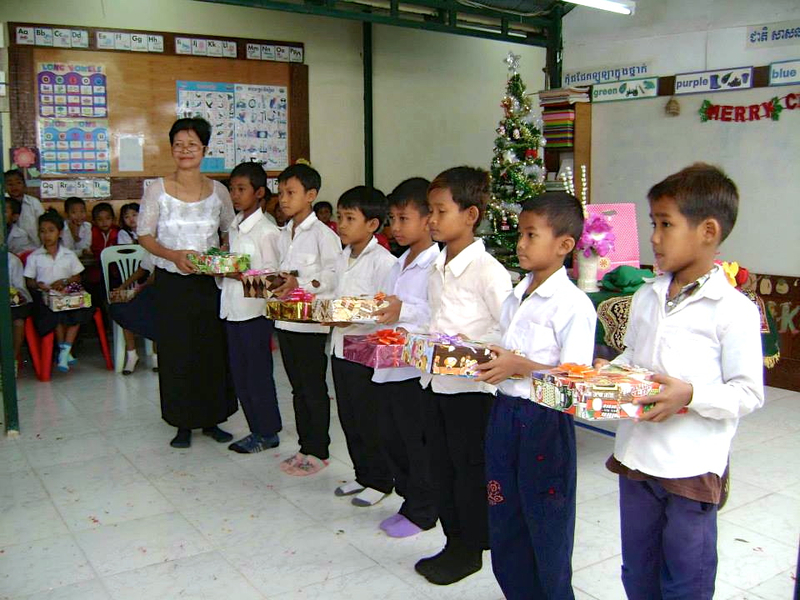 Afterwards they were sent to work in a village called Phnom Thippadei, near Moung Roussei. They were told to cut down some trees and make a home for themselves. Work was difficult. The family had to depend entirely on the KR soldiers for food. All the people were given such small amounts of food that there was not enough to keep their families healthy. About two months after completing their home KR soldiers began asking the people who had had a government job in Phnom Penh before the evacuation. Srai Sim’s husband was a soldier for the previous government, so he was included as being a former government worker. All those who had had a government job were being allowed to return to Phnom Penh. Srai Sim was happy that their family would be able to return home, but they were told that for now only the men would be going back. Her husband was taken away. One month after Srai Sim’s husband went home their oldest daughter became very sick and was unable to recover due to the lack of food and medicine. Srai Dtop died never seeing her fourth birthday. 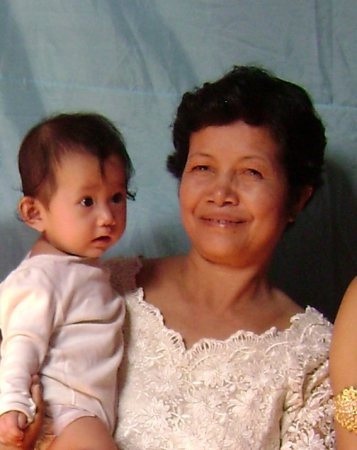 Srai Sim was being given so little food to eat herself that she was no longer able to produce breast milk for baby Srai Owne, and 3 weeks after Srai Dtop died so did little Srai Owne. Soon after Srai Owne’s death one of the KR soldiers came to visit his mother in Moung Roussei. The soldier told his mother that all the men who were taken back to Phnom Penh were actually taken out to the forest and executed. The mother told Srai Sim, and so Srai Sim then knew that her husband was dead also. Soon the KR soldiers noticed that Srai Sim no longer had any children to care for, so they assigned her to hard labor in the rice fields. Srai Sim would begin work at 6am and work until 10pm each day, with 3 hours’ worth of break time in between. During her breaks she was given only rice soup to eat. She was given a quota of how much work she needed to do each day, and was threatened death if she didn’t meet her quota. The KR followed through on these death threats with workers who could not keep up. Often Srai Sim had difficulty just to keep standing. As a result of the relentless labor, and the lack of food, Srai Sim began to lose her eye sight. Her friend needed to guide her around as she worked. Srai Sim was afraid that if the soldiers saw how blind she was becoming they would shoot her because she could no longer work. When the rice season was over she was then assigned to driving a cart pulled by cows to haul wood and other building materials. The people were being forced to build new homes for the KR soldiers. The work was easier for Srai Sim, and she recovered her eye sight. She hauled the wood from the forest to the construction site each day. One of the home builders was a man named Heang. Heang was a farmer before the KR took control of the country. He too was a forced laborer. The KR foreman of the construction site noticed that Srai Sim and Heang were both single and he decided that the two of them should marry. It was the plan of the KR to force farmers and city dwellers to inter-marry. When Srai Sim was told this she refused. 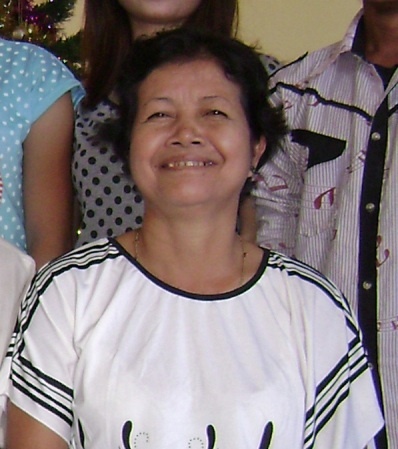 When asked why she refused she said she had a husband waiting for her in Phnom Penh (she knew he was dead). The soldier told her that her husband would already be remarried himself. She still refused. The soldier said he would kill her if she continued to refuse. She told him to kill her and that she’d rather die than remarry. Thankfully Srai Sim’s friend stepped in and spoke some reason to her by saying that someday the KR would be gone and she would be free to do what she wanted and wouldn’t have to stay married. Srai Sim agreed to the marriage. So, along with 22 other couples, they were all forced married on the same day. Although Srai Sim was dead set against the marriage, Heang was very happy to have a wife. He was afraid of Srai Sim leaving her. He would hold onto to her very tightly at night so that she wouldn’t sneak away. Soon Srai Sim was back in the rice field again, and Heang was sent into the forest to cut trees 40 km away. Whenever Heang was given some days off he would walk the 40 km, night and day, to visit his wife, and then walk the 40 km back again. Towards the end of 1978 Vietnam invaded Cambodia in order to topple the KR government. The fighting made its way to the Moung Roussei area. KR soldiers began killing many Cambodians rather than letting them escape during the chaos of the fighting. The KR soldiers rounded up Srai Sim and all the other workers and took them into the forest where Heang was working. They sent everyone up a small mountain to create a stronghold against the Vietnamese soldiers. It was extremely hot up the mountain, and they began to run out of drinking water. Some of the Cambodians couldn’t take the heat and thirst anymore and ran down the hill to escape. They were killed in Vietnamese/KR crossfire. If the KR soldiers saw Vietnamese soldiers taking Cambodians to safety they would open fire. Srai Sim and Heang realized that they were going to die on that mountain. They decided to make a run for safety. As they ran the KR soldiers began to fire at them. Thankfully they were not hit. The Vietnamese soldiers saw them and yelled to them to keep running. Srai Sim and Heang made it to the Vietnamese and were taken to safety. The Vietnamese defeated the KR and by early 1979 the Vietnamese took control of the country. The town of Moung Roussei was now relatively safe from the KR so Srai Sim and Heang settled there together. In 1980 Srai Sim and Heang had their first son, Sarin. Later they had more children: a daughter, Makara; two more sons, Petra and Seyha; and then two more daughters, Gunya and Dtolla. When Sarin was 17 years old he began attending a Christian church in the area. Sarin became very involved in the church and began to invite others his age to attend. Srai Sim herself was not interested in Christianity but she didn’t mind that her son was involved. At this time Srai Sim was a financially successful saleswoman. She was also a strong Buddhist and she would give offerings regularly at the local temple. Sarin would often encourage his mom to come to church but she would always refuse. Soon hard times fell on Srai Sim again as she fell into serious financial problems. Heang himself was only able to do small jobs here and there and could not raise enough money to support the family alone. Srai Sim began to question her Buddhist faith. Sarin again invited her to come to church and this time she accepted. At the church service Srai Sim felt the touch of God and she cried throughout the entire service. She didn’t know why she cried, but she knew she was encountering God. She began to follow Christ. In 2002 the entire family decided to move to Poipet. They knew that Sarin could get himself a job at one of the casinos. He could then make good money to help the family. Sarin did get a job at a casino and soon Srai Sim’s other children were able to get jobs as well. Srai Sim was now totally trusting God for all her needs. She knew that God was with her. She started a small house church out of her home and began to teach her neighbors about Christ. Today Srai Sim is still serving God and is the director of our school in Poipet. She is strong in her Christian faith, and works hard to lead others to the truth she has found in Christ.